A program that manage a class by evaluating each pupil in a list of subjects that you specify. 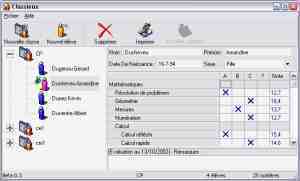 It is possible to print the statistics on an entire class or on a unique pupil. TButton97 yes yes ? ? TEdit97 yes yes ? ? TCombo97 yes yes ? ? You can print the stats on a class or a pupil (with print prewiew). I do not maintain this prog because i do not remember what i did.